THE RACE IS ON: UML and FSFN's mayoral candidates, Basuruddin Ansari. Birganj was not just the epicentre of the Madhes movement in 2015, but also the city worst hit by the five-month Indian Blockade. This gateway to Nepal’s trade, and the only metropolitan city in Province 2, goes to the polls next week. It has not yet fully recovered from the devastating economic impact of the blockade, and many businessmen are still struggling to pay the debts they incurred during the prolonged business slump. In the final phase of campaigning for local polls on 18 September, Birganj is a microcosm of everything traditionally associated with elections in these parts: money, muscle, betrayal. Ex-Mayor Bimal Srivastav was expecting a ticket from the Madhes-based RJPN to contest another term. But the party chose Rajesh Man Singh as its mayoral candidate, probably concluding that Srivastav’s political credentials alone would not suffice and that it needed someone with the power of both ‘money and muscle’. Srivastav was Singh’s political mentor. Singh himself is from the Newar community and a local contractor who hugely benefitted from Srivastav’s political patronage and rose as a youth leader, amassing wealth along the way. The RJPN saw Singh as more capable than Srivastav in dishing out patronage, mobilising youth and hiring goons. A day before nominations closed last week, Srivastav quit the RJPN, and Bijaya Gachhadar’s Nepal Loktantrik Forum fielded him as its own mayoral candidate for Birganj. The two will now be close rivals for the post. 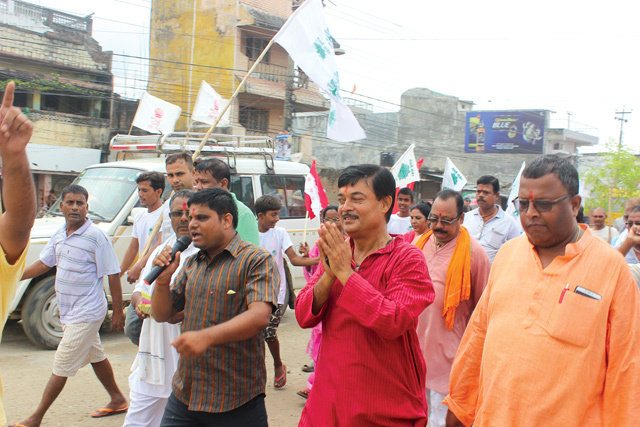 NC mayoral candidate Ajaya Dwibedi (in red shirt, right) in his election campaign. The Madhes-based parties, especially the RJPN and the FSFN, must win to prove that people in Province 2 support their demand for amending the Constitution, so they chose potential winners even if it meant giving tickets to dubious candidates with iffy reputations. The opposition UML, which successfully rode the nationalist (read anti-Blockade) agenda in previous phases of local elections, has not watered down its rejection of amendments to the Constitution. How well its anti-India platform will play out in the Tarai, especially Birganj, remains to be seen. UML leaders have maintained that people in the Tarai do not endorse the agenda of the Madhes-based parties. The UML is therefore under equal pressure to prove that it is right about the Constitution amendment, which means it has to emerge as the number one party in the Tarai, or at least maintain its lead over the NC by winning a significant number of local government positions. 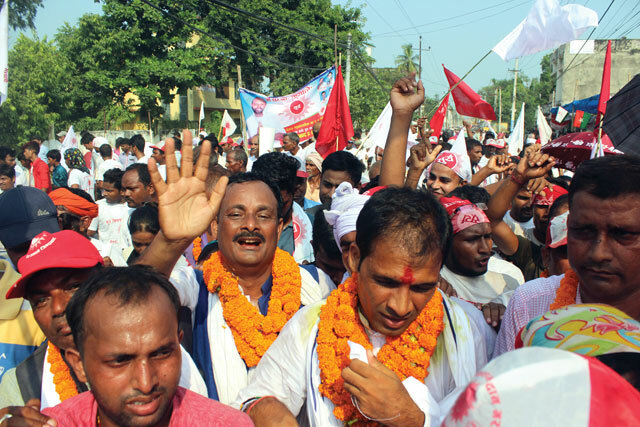 The UML fielded the controversial Basuruddin Ansari as its candidate for Birganj mayor. As an investor in the tainted National Medical College here, his meteoric rise as a businessman is mysterious, and the media has linked him to underworld don Dawood Ibrahim. The way he is splurging money during this campaign has also raised suspicions about his source of income. Ansari was initially close to the NC, but joined the Maoists to stop the constant harassment from their trade union in his hospital. He defected to the UML last month. 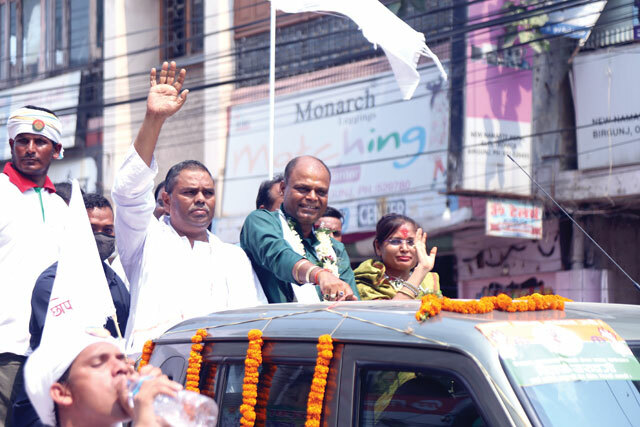 Unlike the UML and Madhesi parties, the NC has fielded ever-loyal Ajaya Dwibedi, its district president for Parsa, one-time deputy mayor and MP. The NC’s coalition partner, the Maoists, have fielded Rahabar Ansari, a 31-year-old, foreign-educated Muslim, among the 21 candidates for the Birganj mayor post. How Ani Choying Drolma honours and aids her sangha.